I just want to say that I feel very sorry for George in this episode, not necessarily because the other kids were picking on him for being "disgusting", but mainly because nosebleeds in general are no fun... I've been there before, and if it can't be controlled, you know what they do? They literally electrocute in the inside of your nostril. I'm not joking; I had a nosebleeding problem a few years ago, it could be controlled, so my mom took me to this sadistic creep of a doctor, who shoved what was almost like a little cattle prod up my nose and eletrocuted the blood vessels to stop the bleeding... pardon my French, but it HURT LIKE HELL! Probably the most intense, agonizing, excrutiating pain I ever felt in my life. I sure hope George has better luck with his nosebleeds, and it doesn't come to this. Barfine really showed her nasty side in this one, but got a not-so-pleasant taste of her own medicine as it came back up from her stomach, through her esophagus, and all over the cafeteria floor. Episodes like this one and Draw! really make Francine believable, specifically because she's usually a pretty likable character. I think the fact that she's occasionally mean-spirited actually makes her much more interesting. Like most real-life kids, she shows the capacity to help and harm others, and learn from her mistakes. I'm really impressed with how effectively she transitions from detestable bully to sympathetic victim in these episodes, and all over the course of just 15 minutes. This can't be said of very many cartoon characters. Same here with getting nosebleeds. I'm also susceptible to nasal allergies which just makes it even worse. 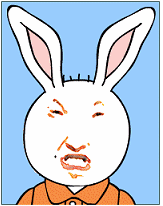 Funnily enough though, unlike George I was never made fun of for it as a kid. The few times I had a nosebleed at school, the other kids were concerned that I was dying or something. Notice though that future episodes involving George never mention his nosebleed problem again. I guess it was one of those one-episode-only things that the show is known for. I agree about the duality of Francine's character. 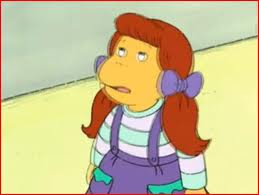 Muffy has that same quirk as well, albeit on a much more subtle level. But other times it's overdone to the point that I find it offensive. Take the episode where Jenna is a bedwetter. Early on, Francine makes fun of Jenna behind her back (literally), that she can't sleep anywhere without her mommy and daddy. Then at the end of the episode, Jenna tries to hide the fact that the pullup is hers by passing it off as being someone else's. Francine tells her off, saying that she might have hurt somebody's feelings. Gee Francine, what about Jenna's feelings when you were making fun of her behind her back a day ago? That's true about Muffy. It's sort of the reverse for her - while Francine's usually a nice person, Muffy's usually misguided and selfish, but only on rare occasion shows hints of goodness (i.e. planting cherry trees or confessing that she cheated off of Francine). She does seem much less likely than Francine (or anyone else, for that matter) to be able to see the error of her ways. Either that, or she just doesn't care enough to change them. Peachy icing on a bundt cake, dammit! I think it's just easy from a writing standpoint to place Muffy in those kinds of roles, as is making her the villain, or a foil to make another character-- usually Francine 9 times out of 10-- look good, etc. Plus she makes for a convenient scapegoat whenever the kids are being mean as a group. Going back to "Vomitrocious" (just so we're not completely straying from the original topic ), when all the kids are making fun and laughing at George in the Sugar Bowl, Muffy is the only one out of all of them who is actually shown laughing. I've taken a liking to Muffy for those reasons, out of spite for the lazy writing. Plus it's fun to root for the villain every once in a while. As for her hair, it's safe to say that she has worn more hairstyles than any other character. All good points. It's subtle because she's always alongside the main group as a friend, but Muffy really is the main villain of the series. Though she's not necessarily a direct adversary, she usually passively represents the wrong message or some immoral position that the "good guy" characters must avoid to successfully deliver a good, wholesome message to the audience. Her position of wealth, vanity and self-interest is a lure and real-life temptation that the young audience is led to see through. In that regard, she's a bit of a Satan figure. Her extravagant wealth, value of the material over the spiritual, family tradition of deception, and frequently-changing hairstyles and outfits; a unique shape-shifting ability that no other character has shown to such an extent; all make her fit the symbolic role even more so. And by virtue of her villainy, here Muffy has successfully managed to hijack poor George's nosebleed thread for herself. I've actually never had a nosebleed. I consider myself lucky for that, they seem terrible to have. 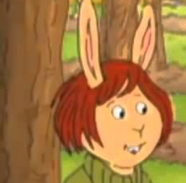 By this point in the series, I wasn't surprised by Francine. She had already showed her two faces in the earliest seasons, like when she poked fun at Arthur about his glasses and the grudge-holding attitude in "Locked In The Library!" What was interesting however was the fact that she recompensed George at the end of the episode. In her earlier spells of evil, she would simply keep her personality until the end of the episode. 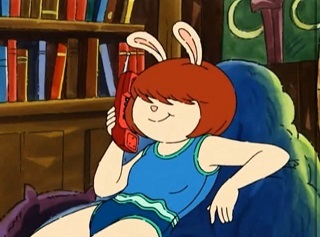 It's interesting, Francine really did start out in the books as primarily a bully and antagonist. This is before even Muffy hit the scene, back in the fabled era of the 70s and early 80s. First, she made fun of Arthur's nose, and then his glasses as you mentioned. 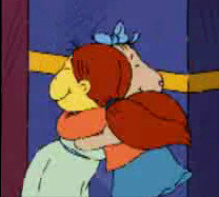 Once Muffy showed up and assumed the role of key antagonist, Francine grew into more of a frenemy, and then finally into a platonic best female friend. An evolving little monkey, indeed. Poor George. 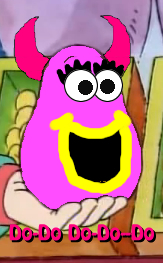 First Muffy, and now Francine commandeering a topic that was originally about him. All fear the mighty Jewfro! Thankfully he was reborn in time to die a second, much more terrifying death around 1:25.